As parents to three children of various ages, there's not a day that goes by where we don't want what's best for our family - whether it be the food we serve to the clothes we buy, or just simply how we choose to live our everyday lives. The same goes for the beauty products that we choose to use on our children. Thankfully, Garnier has come out with a new line of hair care products aptly named Whole Blends, which is suitable for the entire family (excluding babies) including children that are old enough to use regular shampoos and conditioners. I love that Garnier Whole Blends products are Paraben Free, and contain Natural Extracts and gentle sulfates. Each blend focuses on a unique hair action too. Lately, my hair has been suffering from a dry spell, thanks to my love affair with my curling wand. After using Whole Blends Smoothing Shampoo and Conditioner infused with avocado oil and shea butter, my hair felt smoother and is easier to manage. I can't wait to see what my hair will look (and feel!) like over the next couple weeks as I continue to treat it with Whole Blends. My kids (ages 3 and 6) were treated to Whole Blends Nourishing Shampoo and Conditioner with coconut oil and cocoa butter. The first thing my son commented on was the "yummy" smell of his new shampoo and conditioner - a win already! Both my son and daughter have naturally curly hair and Whole Blends was able to tame their curls, while making them soft, smooth and frizz free. Garnier is giving SwankMama readers a chance to try a sample of Whole Blends! Follow this link and join the Garnier movement today. Love to party? 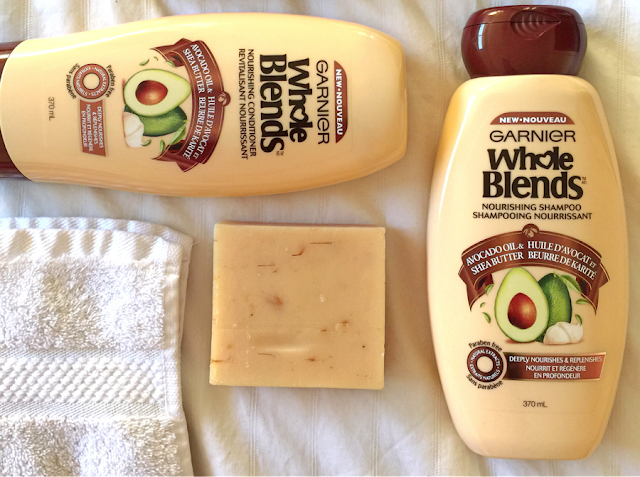 Join the Garnier #WholeBlends Twitter party on Thursday, February 4, 2016 at 7pm EST for your chance to win some fabulous Whole Blends products!